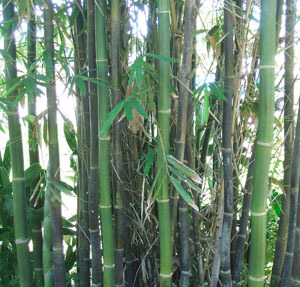 Bambusa oldhamii, common names: Oldham's Bamboo, Giant Timber Bamboo, is an old favorite with very straight, erect culms with thick, but soft walls and short branches. This is one of my favorites. One day I received a package in the mail that turned out to be a division from my good friend Farley in San Jose, CA area. In just a few years it has turned into a rather large clump with thick culms that are arrow straight up and down at least 40 foot high. It prefers full sun. 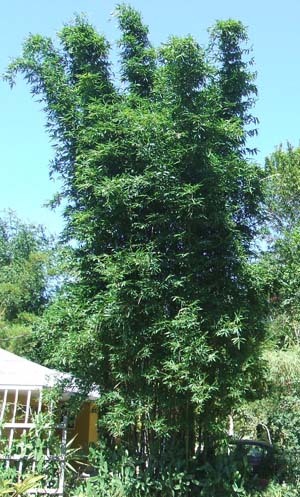 This very attractive bamboo thrives in Florida and California where it's a very desirable specimen plant. The new shoots are edible.